Edwin T. (Tom) Cotton was born in Louisville, Kentucky, in 1944 but was reared in Cordele, Georgia and Arlington, Georgia. Tom graduated from Arlington High School in 1962. He attended the University of Georgia in Athens, Georgia where he received a B.B.A. in Accounting in 1967 and a J.D. from the University Of Georgia School Of Law in 1970. 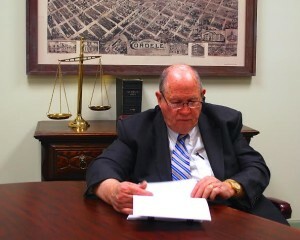 After graduation, Tom returned to Cordele, Georgia where he has engaged in the practice of law since. In 1985 and 1986 Tom served as District Attorney for the Cordele Judicial Circuit at the request of Governor Joe Frank Harris and pursuant to his subsequent appointment by Governor Harris. Tom is married to the former Linda Fincher Cotton and they have 4 sons and 12 grandchildren.